The FBI is screening mail sent to the cast and crew of Empire in a bid to hunt down Jussie Smollett's attackers. Agents are working with a private security company hired by the show to catch the person who sent Smollett a racist, homophobic letter just days before he was jumped by two men in ski masks. The team wears gloves as they sift through the mail so that evidence is not contaminated and are on high alert to prevent dangerous items and hate mail from being posted to the cast, according to TMZ. 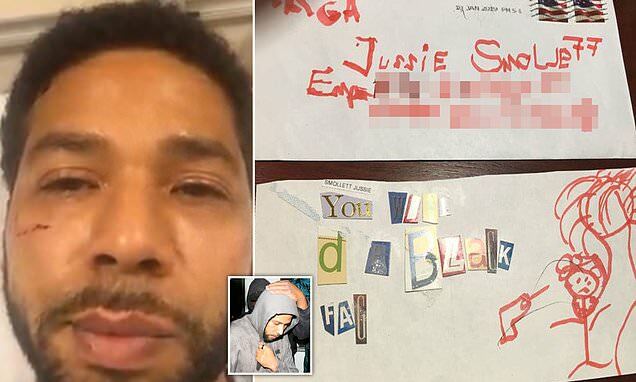 It comes after Smollett, 35, was sent a letter that read ‘You will die black f**' in cut-out letters and featured a drawing of a man being shot and hung from a noose. It came with MAGA inked on the envelope in red pen and was sent to him eight days before he was attacked. Sources say the security team has already intercepted hate mail - but hasn't noticed anything out of the ordinary, as the show has been targeted with racist and homophobic letters in the past. Security on the set has been ramped up too, with daily checks being conducted to sniff out anything, or anyone, suspicious. Yesterday, video emerged from Jussie Smollett's performance in Los Angeles over the weekend, including the moment he spoke out for the first time about the recent hate crime that occurred just a few blocks away from his Chicago apartment. 'I was bruised but my ribs were not cracked, they were not broken. I went to the doctor immediately, my friend [filmmaker] Fred Jackson drove me, but I was not hospitalized,' Smollett says in the video.